Education is full of priorities: getting kids ready for kindergarten, getting children reading on grade level, developing students’ STEM skills, building social-emotional skills, addressing nature deficit disorder (children spending too little time outdoors), developing thoughtful citizens, training future workers to compete in a global marketplace, and so on and so forth. They’re all interlocked to a certain degree. A child with high-quality early learning opportunities is more likely to read on grade level and be able to access rigorous STEM content, and so forth. This is part of why high school graduation often serves as the one education goal to rule them all. A high school diploma is supposed to wrap up all these other goals, to signal that a graduate has the requisite skills to continue her education in college or begin her professional career in the workplace. That’s why so many advocates focus on raising the number of kids who reach that milestone. But there are dangers to treating high school graduation rates as an isolated educational goal. For instance, in April, LA School Report’s Sarah Favot showed that the Los Angeles Unified School District (LAUSD) appears to be raising its graduation rates by adjusting the criteria for getting a diploma. After a 2015 school board decision to allow students getting D’s in core coursework to still earn a high school diploma, 53 percent of the district’s 2016 graduating class did just that. Los Angeles isn’t alone. Voice of San Diego journalist Mario Koran found a similar situation in the San Diego Unified School District this year, where over 40 percent of graduates logged a D in at least one of their core classes. Let me be clear: It’s good to raise high school graduation rates. But that doesn’t mean it’s good to raise them by any means — by lowering standards or turning a blind eye to quality. Should a student be prevented from graduating high school simply because he or she got a D in visual arts (for example)? In isolation, that seems nuts. But, like every educational goal, high school diplomas aren’t an isolated priority. For instance, California’s public colleges require incoming students to have C’s in all core high school courses. LAUSD’s (and San Diego’s) weaker graduation requirements do not align with the state’s college entry requirements. Sadly, this situation isn’t particularly uncommon across the country. I think there’s a conceptual problem lurking behind all this. The push to raise graduation rates can get myopic and lose sight of the fact that credentials are proxies. They represent a bunch of things that their possessors supposedly have. If you have a driver’s license, we generally expect that it means you have at least baseline mastery of the skills and knowledge involved in driving a car. If a kindergartner has a vaccine record showing that she’s gotten all the shots for school, we treat her as if she is unlikely to be a disease vector for measles or chicken pox. If a person has a Ph.D., we assume that he has an expert-level understanding of his field (as well as below-average social skills). When it comes to education, there’s a real danger in letting battles over proxy credentials like high school graduation rates screw up our thinking. We care about low high school graduation rates because they correlate with lots of bad long-term life outcomes. No problem. But then we use that proxy as a target, as a good thing in itself: “Fix high school graduation rates and you’ll fix a bunch of other educational, social, economic, and political problems!” Trouble is, correlations like these usually oversimplify the process of education. What’s the lesson? Consequential benchmarks need to be real. If we smooth the path to high school graduation only to find that a growing number of high school graduates lack key skills for success in college and/or their careers, we should wonder if that consequential credential still matters as much as it used to. You get the picture. Credentials are supposed to consolidate a bunch of useful information into a single data point. That’s why a high school diploma is a goal, but it’s not really an end in itself. 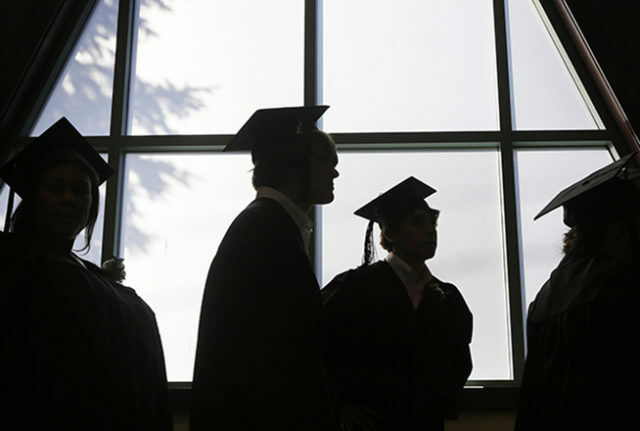 It’s both a culmination and a means to the graduate’s next step: college or the workforce. They call it a commencement ceremony for a reason.